The Skylab Shroud is installed on Dec. 3, 1970, at the NASA Lewis Research Center Plum Brook Station, Space Power Facility. 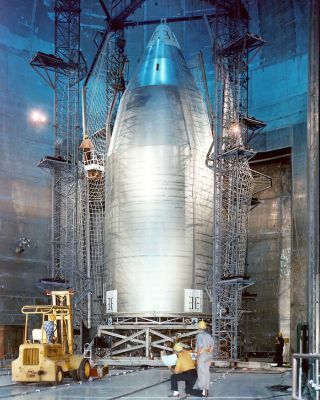 In this historical photo from the U.S. space agency, Skylab's Shroud is installed in the NASA Lewis Research Center's (now known as the Glenn Research Center) Plum Brook Station, Space Power Facility. The shroud protected the upper section of the Skylab space station, including its solar power arrays. When it was constructed, the Space Power Facility (SPF) was the world's largest vacuum chamber. It stands more than 122 feet high, 100 feet in diameter and provides a vacuum environment for the study of space propulsion. Originally commissioned for nuclear-electric propulsion studies, the SPF has been recommissioned for current and future use in the ongoing research and development of space propulsion systems.